A very high-quality magazine from D&H (Labelle), these 30 round magazines are perfect additions to your shooting safe. 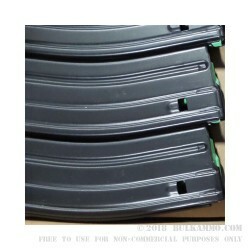 The durable Teflon coated black finish offers a lubricity and finish protection hat standard anodized magazines just cannot compete with. Not only is the magazine coated in this durable, efficient coating, it is also anodized and heat treated to the military specification for the ultimate in durability and weather protection. The spring is made with 17-7PH which gives an extreme durability and reliable feeding with the included Magpul style follower. These are a proven design and made to the highest standard, with all specifications built in for easy assurance of compatibility and versatility. The Aluminum body is the same as the G.I. magazine and the floor plate can be removed for ease of cleaning. The stamped, ribbed design gives rigidity for flawless feeding and long-term durability with extreme mag changes, bumps and drops. You can expect years of service from these exceptional quality magazines made in the USA by a proven contractor. They accept all aftermarket magazine accessories and are built to last.